Making bath and body products is big business. From shower gel to skin lotion, bubble bath to body butters, these beauty products are easy to make, easy to sell and super high profit. Most bath and body products which retail for $15 cost less than $1 to make. You can let your creativity go wild formulating endless combinations of aromas, essential oils, botanicals and fruit extracts. Start a private label cosmetics manufacturing business and make bath and body products under myriad brands for myriad retailers – private label manufacturing is enjoying unprecedented growth (and unprecedented profits). You can get started for minimal investment – why buy a franchise for a popular bath and body products company for $120,000 when you can set up your own for much, much less – using professional formulations just like the multi-national manufacturers – and keep the profits for yourself. You can start your cosmetics manufacturing business from your kitchen table or workshop and expand your body and bath range to make makeup, make cosmetics, make shampoo and even make detergent. The article below provides an overview into the basic formulating requirements for making bath and body products. With the AustraLab program, you don’t need to understand the chemistry of making toiletries – I’ve done all the hard work for you. The formulations have already been tested for efficacy and ease of manufacturing. Click here to discover how to start your own business manufacturing toiletries, bath and body products. For those who are interested in the chemistry of formulating your own products, this article will provide a more detailed insight. A large variety of bath and body products are now available on the market, with many brands catering exclusively to this segment. Foam baths are among the most popular bath preparations, enjoying very healthy growth in recent years.They are available in liquid, gel and powder forms. Although body cleansing is the primary function of a bath, successful bath products need to offer more than just good cleansing properties. Bath products need to provide a sensory experience, as well as therapeutic properties. As well as cleansing, a bath offers the opportunity to apply many desirable health and beauty ingredients to the skin, although not necessarily so efficiently when these aids are used individually. Functioning as a body cleanser, a bath soaks off and suspends dirt, grime and body oils. It prevents the formation of the bathtub “ring” that usually results from the use of soap. Therefore a bubble bath is considered superior to the traditional soap and water bath. Additionally, a well formulated bubble bath will condition the skin, deodorize, perfume the body and the bathroom, stimulate the senses, and promote relaxation. It should provide copious foam at minimal detergent concentration. The foam should be stable, particularly in the presence of soap and soil and within wide limits of temperature. The foam stability should be reasonable and not excessive. It is possible to prevent premature breakdown of the foam, by late use of soap. It should prevent bath tub “ring” formation. It must be non-irritant to the eyes, skin and mucous membranes. It should have adequate detergent power so as to cleanse the body efficiently. In order to counteract any excessive harshness to the skin it is advisable to include a low level of skin emollient. As already mentioned, foam baths are available in several physical forms and clearly the choice of raw materials is highly dependent on the final products. Before discussing the product types in detail, it is of interest to examine the raw materials available. The foaming agent is the most important ingredient in all foaming bath products. While selecting a surfactant it is important to bear in mind the properties that good foaming bath products should exhibit. The anionics are the most widely used; both non-ionic and amphoterics are also of considerable interest. Due to eye irritancy and incompatibility with soaps and anionics, cationics are not advisable to use in bath formulations. The anionic surfactants used are the sodium, ammonium and alkanolamine salts of fatty alcohol sulfates, fatty alcohol ether sulfates and (sometimes) alkyl benzene sulfonates. Firms are not suitable surfactants for use in foam baths – in hard water, calcium and magnesium soaps precipitate as a dirty hard scum. Perhaps the most popular surfactants used in foam bath products are the fatty alcohol ether sulfates, especially the sodium salts and in particular, those based on lauryl-myristyl alcohols and containing 2 to 3 moles of ethylene oxide per mole of the alkyl ether sulfate. Copious foaming in hard water, reasonable foam stability in the presence of soap, fragrances, oil additives and body debris, together with a good skin compatibility, make these materials and obvious choice for bath products. A high degree of proficiency as a limestone dispersant prevents bathtub ring even in very hot water. 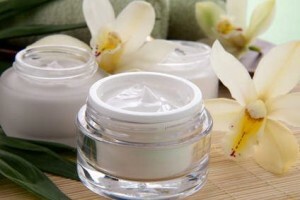 Other advantages of these surfactants are good color, which permits the use of very delicate pastel colors if required. A good viscosity responds to electrolytes and unusual solubilizing powers for perfumes. Primarily for reasons of cost, alkyl benzene sulfonates (mainly branched-chain dodecyl benzene sulfonates) soon found their way from household detergent uses into toiletry items such as bubble baths. Of all the synthetic surfactants, the sodium alkyl benzene sulfonates are probably the most suitable for spray drying and until recently most of the commercial products on the market in bead form consisted of this material and various salt builders and extenders. When biodegradability considerations became critical, the importance of linear alkyl benzene sulfonates grew. The alpha-olefin sulfonates are commercially attractive and have been used as alternatives to linear alkyl benzene sulfonates in powder foam bath products. Lauryl sulphoacetates are sometimes used in high-priced powder or granular bath products but limited solubility has greatly restricted their use in liquid products. The sulphosuccinates, particularly the mono-esters such as the disodium lauryl alcohol polyglycol ethers sulphosuccinate, are considered to be very mild detergents with good foaming properties. They are free from any tendency to irritate the skin and mucous membranes. Furthermore, they are also claimed to increase the tolerance of the skin to other detergents such as fatty alcohol ethers sulfates and alkylbenzene sulfonates. The paraffin sulfonates produced by the sulphoxidation of n-paraffins are relatively cheap, in particular, the secondary octane sulfonates. This material, in addition to being biodegradable and exhibiting good physiological properties, is also a good foamer with high solubility in water. The use of alkane sulfonate with alkyl ether sulfates prevent excessive degreasing of the skin and easy thickening of the finished product. The non-ionic components of bubble bath products are used to stabilize faom, to enhance the viscosity of the product, or to solubilise skincare ingredients and fragrances. The nonionic surfactants used in bubble baths are alkanolamide and amine oxides. In addition, ethoxylated derivatives such as ethoxylated fatty alcohols, ethoxylated fatty acids, alkyl phenol ethoxylates, ethoxylated alkanolamides, ethoxylated propylene oxide condensates (pluronics) and ethoxylated sorbitan fatty acid constant condensates are occasionally utilized. Special ingredients such as emollients are often added to the formulation to achieve and maintain a healthy and attractive skin. The value of many of these conditioners has been challenged but they continue to be used with apparent success. Although it has been argued that the bather stays in the bath for too short time to receive any real benefit, equally strong opinions have been expressed that, even in this short time, the skin absorbs active substances. Many such ingredients are available. The following list gives some of the most popular in common use: branched-chain esters, for example isopropyl myristate; decyl oleate; ethoxylated partial glyceride fatty acid esters; protein derivatives; lanolin derivatives; and fatty alcohol ethoxylates; etc. There is no question that the perfume used in any bath product is extremely important. Most of the larger companies marketing bath ranges spend a great deal of time and money selecting the perfumes for their products. (The AustraLab manuals reveal how you can easily copy the fragrances used by the top manufacturers). It should be acceptable when smelling the product in the bottle. In use it should be fresh and have sufficient volatility to give a strong impact. It should linger on the skin to give a feeling of freshness and well-being. It must have an acceptable shelf-life. The level of perfume used will vary between 1 and 5%, depending on the concentration and cost. The nature of the perfume ingredients may require the use of additional solubilisers; the most commonly used are non-ionics such ethoxylated fatty alcohols, ethoxylated fatty acid esters, ethoxylated sorbitan fatty acid esters and ethoxylated propylene oxide condensates (for example, pluronics). Perfumes often cause problems of product instability. They not only affect odour stability, but can cause discoloration, upset preservation systems and cause instability in clear, opacified and emulsion products. Herbal extracts are used in bath preparations, usually to help convey the brand image and to justify therapeutic claims with respect to minor skin disorders. Herbal extracts of most living plants can be obtained if required, but the medicinal nature is often open to speculation. The problem of achieving the required is viscosity of liquid products depends on choice and level of surfactant and foam booster. Even certain perfumes have been found to have a significant effect on viscosity. Generally, inorganic salts such as sodium and potassium fluoride are used to thicken the product where possible, whereas alcohol, hexylene glycol, propylene glycol and polyethylene glycols are used to lower the viscosity when there are thickening problems. However, this can usually be solved by the use of natural gums such as tragacanth, or synthetic gums such as methylcellulose and hydroxyethyl cellulose. The color of foam bath products is clearly important in marketing and care should be taken to select colors that are stable in the chosen product. Obviously, if the products are marketed in clear bottles, adequate light testing should be carried out. Interesting color effects in the bath can be achieved by the use of indicator colors and fluorescein. Foam bath products are easily attacked by moulds and bacteria. Hence, they should have a sufficient amount of preservative. Bacterial attack can produce opacity in products that are intended to be clear, separation in emulsified and pearlescent products and can cause changes in both perfume and color system. When an opaque liquid foam bath product is required, an opacifier is needed. Higher alcohols such as stearyl or cetyl alcohols; ethylene glycol mono- and distearates; glyceryl and propylene glycol stearates and palmitates; and the magnesium, calcium and zinc salts of stearic acid are used. Clearly, viscosity is an important factor in the stability of such systems. The manufacturing technique used is vitally important in achieving maximum stability. Ideally, when using the opacifiers mentioned above, all the ingredients (except perfume) should be heated to 65 to 70° C and allowed to cool slowly to ambient temperature with gentle mixing, when the pearl will develop. Rapid cooling will produce less pearly products that may be unstable. It is possible, however, to obtain blender-opacifier detergent concentrates of some of these opacifiers which eliminate the need to heat the batch. Liquids can be further divided into clear, translucent, opaque, pearlescent and multilayer product. The formulation possibilities for a medium priced clear liquid foam bath product are endless. More expensive but milder formulations can be achieved by replacing part of the sodium lauryl ether sulfate with coconut imidazoline betaine. Translucent and pearlescent products can be created by the addition of insoluble stearates. These are readily available from all major surfactant manufacturers and the depth of opacity is governed by the level of incorporation, which is usually between 1 and 5%. Oqaque non-pearlescent products are achieved by the use of polymeric materials. Basically, gels are very similar to liquid products, having much higher viscosity. This is achieved by increasing the level of detergent, foam stabilizer or electrolyte content, depending on the particular formulation. Shower gels are virtually identical in formulation to the highly viscous liquid bath products; however, because they are intended for direct application to body, they need to be very mild. It is usual to adopt for shower gels the types of formulation, already mentioned, that have a milder action on the skin and eyes. Dry bubble baths are of considerably less importance than liquid bubble bath products. Basically, they consist of a mixture of one or more foaming agents, fillers and water softeners to add bulk or act as carriers, perfume, color and free flow agents. The major surfactant ingredients are usually dry products, sometimes fortified with liquid surfactants, for example sodium lauryl sulfate, to give good flash foam. The principal surfactants employed are benzene sulfonates. Other surfactants that have been used include sodium lauryl sulfate, sodium lauryl sulphoacetate and isethionate derivatives. Inorganic fillers such as sodium chloride and sodium sulfate are often used in the more inexpensive products. These can, however, be replaced by functional fillers which also have water softening properties. These include sodium hexametaphosphate, sodium sesquicarbonate in tetra sodium pyrophosphate. Free-floating and anti-caking is obtained by adding tri-calcium phosphate, calcium silicate, or sodium silicate aluminate to powdered bubble bath formulations. Bentonite or starch is usually employed to absorb the perfume, in order to disperse it throughout product. The color is usually incorporated by prefixing with one of the fillers. Sodium sesquicarbonate, which is a mixed salt, is probably the most popular material used in the preparation of bath salts. It is available in uniformly sized, elongated, attractive translucent crystals which are extremely stable, non-caking and free-flowing. It dissolves rapidly and completely in water, is easy to color and perfume. It is an excellent water softener and quite mild to the skin, having a pH value of about 9.8 for a 1% solution. Other carbonates that have been used are sodium carbonate decahydrate. This is a good water softener and consists of large attractive crystals that are readily soluble in water. Unfortunately, it has several serious disadvantages including a low melting point of 35° C, at which temperature it dissolves in its sown water of crystallization. This clearly precludes its use in hot climates. Even under ordinary storage conditions it tends to effloresce to become powdery and unsightly, although this can be overcome by coating the crystals with a film of humectant such as glycerine. It is also more highly alkaline than the sesquicarbonate. The monohydrate is the most stable form of sodium carbonate and is available in attractive crystal agglomerates with excellent stability. Its main disadvantages are its slowa rates of dissolution and the fact that it is more alkaline than the sesquicarbonate. Phosphates like hexametaphosphate, tetrasodium pyrophosphate and sodium tripolyphosphate are used to improve softening. Trisodium phosphate is a good water softener but because of its highly alkaline nature it cannot be used without buffering. However it can be used in combination with either sodium sesquicarbonate or borax, both of which buffer it quite effectively. Borax is less alkaline than the carbonates and posesses a mild detergent action, although it is less effective as a water softener that the carbonate and is slow to dissolve. Rock salt is used in baths of the type that provide fragrance only. It is very stable and its large crystals are attractive and easily colored. It is, of course, non-alkaline and mild to the skin. Its disadvantages are that it has no water-softening properties, it can interfere with soap lathering, and the large crystals do not dissolve easily. For effervescent systems, sodium bicarbonate and tartaric or citric are included. The instability of fragrances is attributed to its distribution in a thin film on the surface of an inorganic salt which can be quite alkaline. Hence, the perfume must have good fixative properties in addition to adequate stability to alkalies, light and oxidation. The deposition, retention and stability of the fragrance may also improve the flow characteristics of the product is achieved by using calcium silicate or fumed silica. As with fragrance, the choice of color is limited by stability to both alkalies and light. Color stability may also be affected by perfume. Insoluble colors have been recommended because of their better stability to alkalies and light. These are best dispersed at a concentration of about 1% in a suitable medium such as glycol or liquid non-ionic surfactant. The manufacture of bath salts is a straightforward process and can be carried out in most types of dry powder blender. Coloring is done either by spraying with color solution, mixing and drying or by immersing the salts in the color solution, followed by drying. Color solution should be hydro-alcoholic or, if possible, alcoholic. 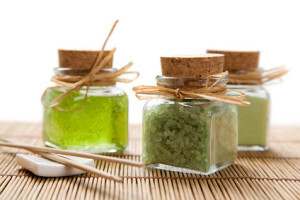 Alcohol, in addition to reducing the drying time, helps prevent solution of the bath salts. Fragrance is added to the color solution. Perfume can also be mixed with oil-absorbent powders. Clearly, in coloring effervescent salts, no water can be used. Bath cubes and tablets employ the same materials as bath salts, but in powder form. The powdered bath salts are first granulated with starch and a small amount of alcohol-soluble gum binder is normally added. The granules are then compressed into tablets or cubes. A suitable disintegrating material like sodium lauryl sulfate or starch should be included to aid the dissolving process before compressing. The primary function of a bath is to cleanse the body. The function of bath oil is not only cleansing but of skin lubrication. In addition, they are used to impart fragrance to the body. The oil bath has emerged as the simplest and most effective method of lubrication for generalized skin dryness. Dry skin affects both young and old and, in its mildest form, appears as a slight roughening and scaling of the skin. Severe dryness can result in disturbing itching and both the incidence and severity of itching becomes progressively worse as the individual becomes older. Clinical efforts to overcome skin dryness are based on the concept that a surface oil or lipid film on the skin retards water loss through evaporation – hence the importance of oil baths in combating dry skin. Various investigations have been conducted, aiming to quantify the absorption of different oils by skin. Recently, the first objective attempt to quantify all deposition on skin using the technique of arm immersion in a bath of oil stipulates that products based on mineral oil adhere to the skin better than vegetable oil formulation. Former further, and oil related oatmeal preparation bracket colloidal oatmeal combined mineral oil and letter brackets can be installed very poorly by the skin. It was also so observed that absorption increased as the temperature of the bath was raised and as the concentration of oil increased. Soaking for longer than 20 minutes, however, did not cause a significant increase in oil absorption. Floating or speading bath oils are hydrophobic by nature. They have low specific gravity. Hence, they float on top of the bath water, which covers the bather’s skin with an oily film on emergence from the water. It provides the bather with a luxurious emollient coat. This type of product is ideal for augmenting the aesthetic nature of the bath with pleasant fragrance to the bathroom, since the oil layer on top of the hot bath water allows the fragrance to distill readily into the atmosphere. One problem with this type of product is the occurrence of an unsightly ring around the bath caused by the oil deposit. This deposit is compounded by a soap scum if the bather also uses a true soap in conjunction with hard water. Furthermore, since oils are natural foam depressants, the floating oil layer is likely to impede the lathering performance of the soap. Ideally, a floating bath oil should fully cover the surface of the water and be deposited onto the skin in a very thin film, covering as much of the skin surface as possible. A lubricating bath oil should not be deposited in the heavy greasy layer, which is unattractive to the user, nor should it leave in the bath a heavy oliy film that is difficult to remove. Perfume is obviously an important ingredient. Other ingredients sometimes included are antioxidants, colors and sunscreens. Dispersible bath oils consist of emollient oils, perfume oils and contain a surfactant. 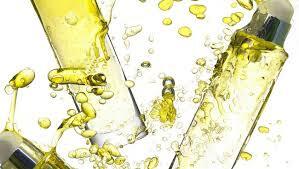 To emulsify the oils in the water instead of making them spread on the surface, a surfactant is used. When poured into the bath water they bloom into a milky cloud. They are sometimes preferred to the floating type because the oils are dispersed uniformly throughout the bath water, providing thorough contact with the body during the bath. When properly formulated, they leave very little oily stickiness or ring in the tub after the water is drained. 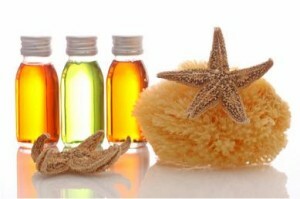 The emollient oils used tend to be similar to those used in floating bath oils, with perfume levels between 5 and 10%. Soluble bath oils contain large quantities of surfactants to solubilise the high fragrance oil concentrations, and also to dissolve or disperse these oils readily in the bath water. They leave no residue in the bath and have no emollient effect on the skin. 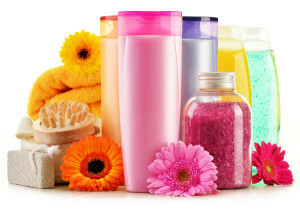 Soluble bath oils are either anhydrous concentrates consisting of perfume and surfactant or solubilized products consisting of perfume, surfactant and water. They contain 5 to 20% perfume oil, which can usually be solubilized by means of a hydrophilic surfactant. Foaming bath oils can be considered either as bubble baths with high fragrance levels or as soluble bath oils with foaming agents and stabilizers. These products provide both fragrance and foaming action. They also serve to eliminate the bathtub ring. Like the soluble bath oils they generally have no emolliency properties. The same foaming agents and stabilizes discussed under foam baths are used. Polyoxyethylene sorbitan monolaurate is often used to solubilize the fragrance in the foaming bath oil. Thickeners such as carbon carboxymethylcellulose, methylcellulose and other gums are commonly added, as are sometimes the sesquestrants. Very occasionally emollient oils are included in these products at significant levels but most of these have such a foam-depressing action that the final products and barely be considered to be a foam bath. After bath products are body or dusting powders and various lotions. Body or dusting powders are also known as body talcs or talcum powders. They have a wide appeal because of the smooth feeling and cooling effect which they impart while they temporarily absorb moisture. The extra heat loss from the large surface area of the talc particles creates a cooling effect. Talc used in these formulations must have good slip characteristics, covering power, body adhesion and absorbency. The slip and texture properties are essentially based on the talc. It is essential therefore, that grit-free, alkali-free, high-quality cosmetic talc is used. Talc should be free of bacteria and sterilized grades should always be used. In order to improve adhesion properties, metallic stearate such as zinc or magnesium stearate and kaolin and are incorporated. Whereas magnesium carbonate, starch, kaolin and precipitated chalk all improve absorbency. Zinc and titanium oxides at low levels, along with earth colors can be incorporated for tinting purposes when required. Perfume oils are easily incorporated and should be sufficiently powerful to cover the base odour yet not interfere with other perfumes that may be used. Other ingredients sometimes included are boric acid to act as a skin buffering agent and fumed silica to produce a powder of lower density. The first two types the less popular due to their greasy nature. Oil-in-water emulsions are perhaps most widely used. Generally, they are sold in lotion form and are usually formulated to give good “rub-in” and feel properties.